We moved to Benicia to find a home that would suit our outdoor interests as well as provide space for our energetic Australian Sheppard, Barley. We quickly fell in love with the small town feel of our new community. We appreciate the downtown events, the farmer’s markets, and beautiful community gardens. Both of us grew up interested in growing food and spending time outdoors. Kirsten spent time after college working on a farm in Hawaii. Nick dabbled with some lettuce growing in a small San Francisco space. After our move to Benicia we dreamed of turning our backyard from a concrete jungle into a food forest. 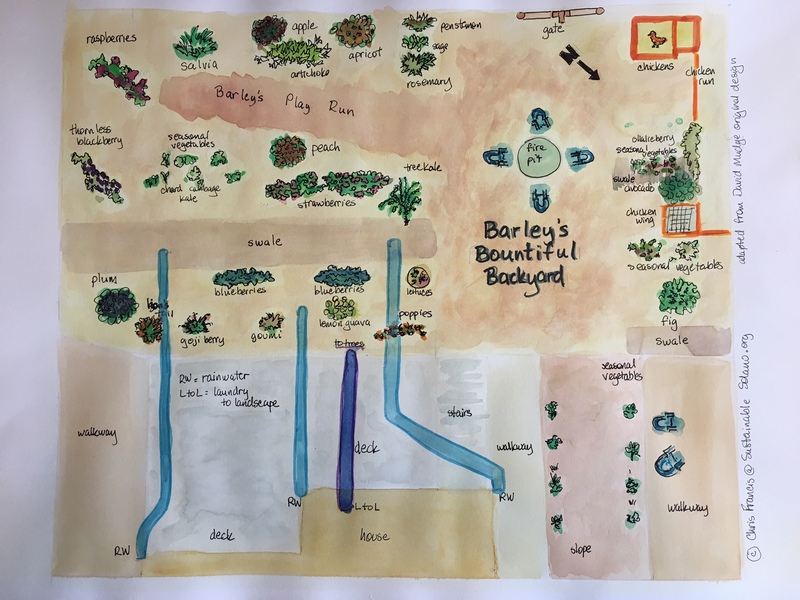 We understood the balance that was at stake – the work to plan, maintain, and learn about backyard farming with the potential of a bountiful and serene place to spend time. 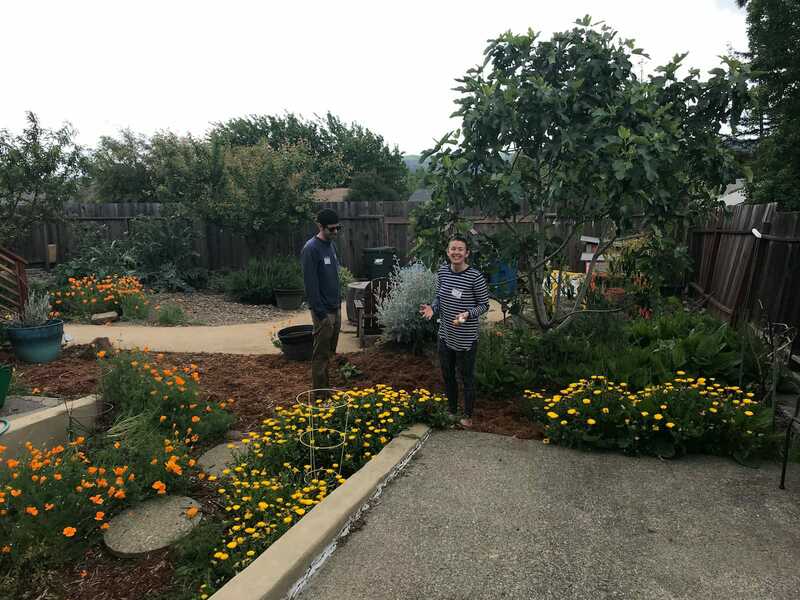 While exploring the city’s library we found a talk on permaculture in the community events message board and read further about the Benicia Community Garden. We were both excited to learn about the garden events and work days. Following that, we found out about the Benicia Sustainable Backyard program at a booth advertising the application process downtown on a farmer’s market night. As we began to meet with the program leaders to plan our garden, we began to understand that the project was just as much about balancing our personal needs with our desire to grow food in the most sustainable manner possible. We hoped to learn about the permaculture planning and development process. We ended up removing 25 tons of concrete from our backyard prior to the installation! This was a key to creating the food forest that we were really hoping for. On the day of the installation we were gracious enough to have our families help prepare food for the close to 30 people that showed up to our home to learn, conjugate, and work (very hard) together. We can’t wait to share the continued growth of our food forest with our friends and family. Ideally, we will continue to connect with the other families that started their food forest in the same year we did. It would be great to begin a crop swap within Benicia to share our bounty. We think canning and preserving fruit it in our future as well! See a gallery of Barley’s Bountiful Backyard photos here.